I am now the owner of three Texar Audio Prisms. The Texar Audio Prism, later manufactured by Gentner, was perhaps one of the best-sounding fully-analog multi-band broadcast processors. I wanted a stereo pair to experiment using them for home playback and possibly mastering to emulate an 80s broadcast sound. The Audio Prisms are a four band level processor to be used ahead of an Orban 8100 processor and composite stereo generator. The Orban 8100 had a narrow level sweet spot - the Texar kept things where they needed to be. Once I started developing a large digital library I knew I needed a pair of these to keep listening levels in the sweet spot. Properly setup, pretty much everything that goes in the Texar comes out better. The "safety buffer" is a broadband gain control ahead of the four band split filters. The four digital commands are "Quiescent," "Signal," "Expand" and "Peak." The terms used are slightly different than what we normally think of. Schematics have been notoriously hard to come by. The units have been out-of-production for years and Gentner, who later manufactured the Audio Prism, is no longer in business. I now have schematics and I see no harm in providing people the tools they need to repair their own Texars. For now I'll start posting the schematics in bits and pieces but may later publish a circuit analysis once I figure it out myself. The most unique thing about the Texar was its M-101 "Digitally-Controlled Audio Processor." There are four of these gizmos in each Audio Prism. The only primary path audio on these boards is through the Vactrol and it's source resistor. The entire board is sidechain and display. Texar M-101" Digitally-Controlled" Audio Processor Module PC Board. 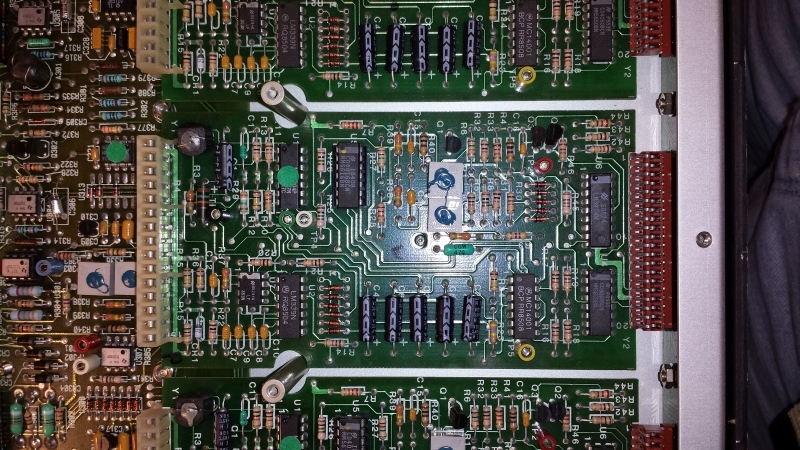 There are four identical M-101 boards per channel. The filters and timing capacitors are on the motherboard so the boards can be freely-swapped between bands. The only primary audio path components on this board are a 15K (varies) resistor and the Vactrol VTL-5C3. The rest of the "stuff" is the Digitally Controlled sidechain. I'll drop back in later and provide credits to the above references. Thanks to everyone who has sent me material and all the websites hosting them. IIRC my car cd player might have a compressor, (or maybe a dolby you could leave on). Wow....I knew that Gentner had moved out of broadcast gear into corporate videoconferencing equipment, but now gone entirely! Gentner made the original "telephone hybrid" gizmo for call-in shows, a niche which has been taken over by Telos. While geeks like me in the broadcast/recording biz knew what a "Getner" was, the channel 9 weather guy back in OKC made that word part of the local vocabulary during severe weather. "We have Val on the Gentner..."
It is actually spelled Gentner, but in true Oklahoma fashion we pronounce it, Get-nrr. Once Gary calls for a Tracker, the Audio Director in the control room pods up their mic. I read that one and thought "pods? Hmmm, pods, I've been in this business for awhile...what the hell does 'pods' mean?" Of course, "pot up the mic." Gentner, Get-nrr, pods, pots whatever. Must have been a spell-checker or editor that changed that one. "Hey Brian "pod" up the Get-nrr so we can take that feed." So when you're through with the phoner do you call to the Audio Director "Get-nrr done?" Very fun article. Thanks for sharing that Brian. I had always been quite intrigued by these boxes since starting commercial broadcast engineering back in the 1980's. Glan Clark took something as simple as a vactrol and designed a pretty decent multiband audio processor for the time. Somewhere in my files I have the alignment procedure for the M101 boards which I researched when I got my first pair of Audio Prisms and not only replaced the Vactrols but also replaced the bias pots with 10-turn equivalents. The vactrols age and keeping these beasts in alignment can be a pain. A regular Audio Prism was turned into an AM processor with the addition of the companion AM limiter/clipper board. The Eagle was the first AM version and used the AMC-1 board. The second version, the Phoenix, used the AMC-2 board. When Gentner took over the product line the Prism II AM used an updated version of this board, designated as the AMC-3. I'm looking for documentation for the AMC-2 AM board as I have a Phoenix I use with demonstrating Part 15 AM transmitters and would like to have it handy for repairs and such. Likewise, if you need a particular section of the manual I may have it as I have the factory manual for the Phoenix, minus the AMC-2 board and documentation. Welcome Bill. That sounds like good documentation to have. I'm not sure how much Wayne has already. Bill - Thank you for joining us! I checked my Prism II manual and it is missing the core schematics of the AMC-3 board and whatever version of M-101/102 card it used. All of the full manuals I have are missing the key motherboard and M-10X boards. 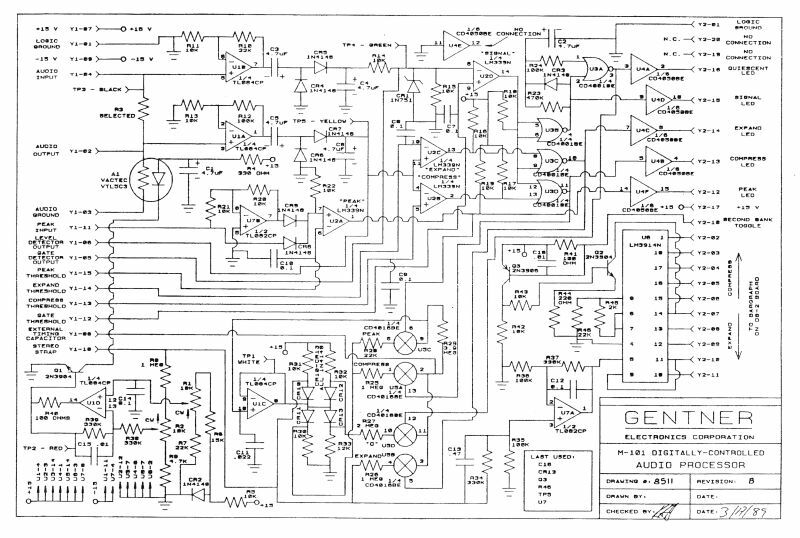 I do have a later Gentner version of the M-102 schematic that was redrawn and is more easily followed. I also learned that there was a European Prism III manufactured. I have two pages of alignment instructions for the Prism III. I'll try to scan today what I have and post it. I just received permission to post the Prism III instructions.